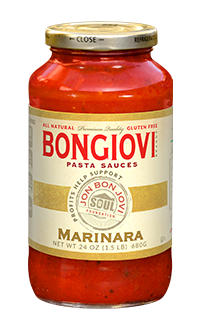 ALL NATURAL | GLUTEN FREE Bongiovi Brand Garden State Style Pasta Sauce is a robust combination of garden fresh vegetables. The fresh Basil, Garlic, Onion, Mushrooms and Red & Green Bell Peppers add an exciting bouquet of flavor to your favorite pasta with just a little kick. Wow, Now that’s Italian! 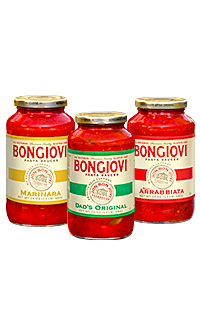 THIS Love I buy three jars of this to make my lasagna. It's a hit every year for Thanksgiving. Thank you for making such a flavorful sauce that can pass as my own. hehe It's our little secret. LOVE this sauce. 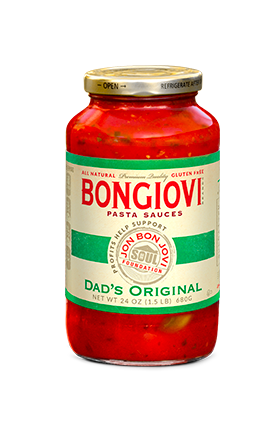 We moved into a lovely, new house recently and decided that we'd invite the Bongiovis to be with us for our first dinner. 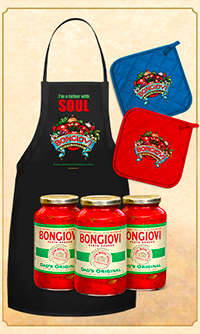 GREAT memories AND an outstanding, reliable sauce that we can augment or eat as-is. SO much better than its ready-made sauce competitors. AND for a great cause. BRAVO! I love the Garden State Style! ITALIAN TOMATOES, BUTTER (CREAM, NATURAL FLAVOR), ONIONS, RED BELL PEPPERS, GREEN BELL PEPPERS, MUSHROOMS, EXTRA VIRGIN OLIVE OIL, CABERNET WINE, GARLIC, BASIL, SALT, PARSLEY, OREGANO, CRUSHED RED PEPPER, BLACK PEPPER.